We’d love your help. Let us know what’s wrong with this preview of Miss Apple Pants by Charlotte Roth. Sometimes life is what you make it. Ella Jensen is an old soul stuck in a teenager's body, and she doesn't make friends easily. In her senior year of high school, her family moves across the country to Seattle, turning her already-small world upside down. She feels alone and lost… But then she finds a box of decades-old love letters between Martha and Frederick; she becomes Sometimes life is what you make it. Ella Jensen is an old soul stuck in a teenager's body, and she doesn't make friends easily. In her senior year of high school, her family moves across the country to Seattle, turning her already-small world upside down. She feels alone and lost… But then she finds a box of decades-old love letters between Martha and Frederick; she becomes best friends with her new midget neighbor, Miss T; and she meets Hans, a very symmetric German exchange student. But summer ends abruptly when she is forced to make a decision that will change her life. Forever. A warmhearted and humorous coming of age story, Lost in Seattle, is a celebration of family, love, friendship, motherhood, and that special bond between daughters, mothers, and women across generations. "Charlotte Roth caught my attention with the snappy chapter titles. She kept it with snappy dialogue, which I adore, unique characters, which I fell in love with, and a story filled with heartbreaking, humorous, and heartwarming moments. It hasn't been easy for Eleanor, living with her tree hugging, 'hippie-like' parents. She's not happy when they move her from the east coast all the way to Washington state. After an exhausting cross-country drive with her parents in a U-Haul truck, they finally reach their destination, only to find the truck is filled with another family's belongings. After five days of being stranded with nothing of their own and limited funds, they finally decide to get some use out of the unclaimed contents of the truck. When they find an iron mailbox full of letters from 30 years ago, the two women in the family decide to read them. The tales of a young couple's struggles three decades earlier weave a complex and interesting pattern into this already interesting web of entertaining story line. This first story of Ms. Roth reads like it's her tenth, with crisp, clean writing. I'm looking forward to reading more from her. I give it 5 stars and high recommendations!" To ask other readers questions about Miss Apple Pants, please sign up. Lost in Seattle is the first book in the Miss Apple Pants series by Charlotte Roth. This is a really great young adult story, a coming of age, with humour, friendship, emotion, drama, mystery, quirky and memorable characters, and more. This story is complex and multi-layered, with two interesting and clever stories woven into a witty, heart-warming and fun read. We meet Ella who has had her life turned upside down when her family treks across the country to move to Seattle right in her senior year at High School. She is scared, a little lost and feels very alone in all this. But when a box of old love letters is discovered, and they begin to read them- an intriguing story starts to form as each letter is explored and she can’t help feeling a connection to Martha and Fredrick, and their story. Some new friends bring some humour and zaniness- and added another element of interest to this already charming read. But, then Ella has to make a life changing decision which twists this story and adds a little drama. Overall this is a heart-warming and very enjoyable read. Not that I would expect anything less from this talented author. The characters: Developed yet mysterious in a way that I can't describe. It felt like I was jumping into the middle of a perplexing problem. And THEN there is a story within the story and we get to know characters in a non-conventional way. And THEN we meet someone who needs to make a life changing decision (one I am well familiar with and appreciated the way the author took the time with it in a very non-judgemental way. The story: Hmmm there are a couple of stories all going on in the same book. The weird thing is that they talk about "last century" as if it was so long ago. I had to keep reminding myself that they were referring to 1981 not 1881. Somewhere along the line I got old and forgot that 1981 IS actually a long time ago. The family: I did not have a relationship with my parents the way that Ella does. So it was all a bit of a fantasy for me, but I enjoyed reading it. This book was fantastic. I am actually placing it in my top ten for this year (and it was written several years ago). Great plot!! Ella is a 17 years old teenager who had it difficult to make friends when her parents were moving every other year. When she finally has that home feeling and people she can call friends in Connecticut, her father informs her that they are moving again on the other side of the country, N Seattle. The journey that Ella starts all the way in Seattle is full of love, friendship, self-discovery. She becomes a woman and finds friends in people she is expecting the least. And the help and Great plot!! Ella is a 17 years old teenager who had it difficult to make friends when her parents were moving every other year. When she finally has that home feeling and people she can call friends in Connecticut, her father informs her that they are moving again on the other side of the country, N Seattle. I didn't want this book to end. I vote a follow up book. :) Having just moved to Washington last year I could relate to the apprehension. Miss Apple Pants by Charlotte Roth was a sweet coming of age story that touch on many different things, good, bad and heart braking. This light hearted read leaves you in a good mood. This wasn't my first read by this author, but my first in her YA genera. Like the other book I've read, the writing was smooth, consistent and easy to read. But, to be frank, there was way too much filler taking up space, and not adding anything to the overall story and plot. I don't know if it was done to up the p Miss Apple Pants by Charlotte Roth was a sweet coming of age story that touch on many different things, good, bad and heart braking. This light hearted read leaves you in a good mood. This wasn't my first read by this author, but my first in her YA genera. Like the other book I've read, the writing was smooth, consistent and easy to read. But, to be frank, there was way too much filler taking up space, and not adding anything to the overall story and plot. I don't know if it was done to up the page count, but if you added all that filler together you could cut the book down by good 50 pages. So much over explain and going down the rabbit hole. Another go at editing will fix this. Also I did find that because of this extra fluff, there were dull and flat areas in the book that had me board. I fell back into some speed reading habits to get to the good parts. When this book was focused it was great. I was engaged, pulled in and invested in the story and characters. Our MC was a little winy at times for my liking, but I looked that over because of her age. I loved the mother and daughter relationship. I love it when I read books where the MC actually has a loving family. Their family dynamic was beautiful and you can tell they truly loved one another and got along. I also like how this story didn't just pick one thing to focused on, as a whole. It mimicked real life and all it's glory of being unpredictable and pretty much a s&it show. Overall, this was a sweet easy clean read. I give you my recommendation and stamp of approval, that you will get all the good feels, have tears in your eyes, while feeling a sort of nostalgic connecting to better days and growing up. This was such a fun and sweet read. I have read a lot of Charlotte’s other novels and was not expecting this from her but I was not disappointed in the change up of things. The ease of the story flow was still strong and evident throughout the process. I felt as if I was there experiencing things first hand with Ella and I was cemented there till the very end of the book. Ella is devastated when she learns that she has to move her senior year and start completely over all the way across the coun This was such a fun and sweet read. I have read a lot of Charlotte’s other novels and was not expecting this from her but I was not disappointed in the change up of things. The ease of the story flow was still strong and evident throughout the process. I felt as if I was there experiencing things first hand with Ella and I was cemented there till the very end of the book. Ella is devastated when she learns that she has to move her senior year and start completely over all the way across the country in Seattle. She is feeling lost and desolate trying to navigate the new world that Seattle is to her when she stumbles upon a box of old letters. While reading and falling in love with the two writers of the letters, Martha and Frederick, she also develops a friendship with her neighbor, Miss T, and an interesting relationship with Hans, a German exchange student. By then end of the summer she has learned a lot about life, come into her own and discovered that you can write your story and the outcomes. Everything seems to be settling well for Ella when suddenly she is faced with a very important and life changing decision. Will she make the right decision? I adored every moment of this novel. It was deep and emotional, but was effortless to read because the way everything balanced with the style of writing that Roth possesses. I was so bummed when it was over and I am anxiously waiting for more. I am a bit conflicted about this one. I felt entirely dissociated from the main themes of infertility and motherhood. As someone utterly terrified of pregnancy who doesn't even want children, I could not connect with this particular coming of age story. The constant mention of 'little feet' made me feel nauseated. The ever-growing array of coincidences, drama, and millions of new plot points brought about a similar response. On the other hand though, I really enjoyed the writing style and the orig I am a bit conflicted about this one. On the other hand though, I really enjoyed the writing style and the original premise. I picked this book up because it was one of the very few novels set in Seattle whose synopsis appealed to me. Some of the references to the city and area were lovely. The main characters were very likable and I really enjoyed the character development, particularly that of Miss T (up until it became unreasonable). It was a sentimental read and much heavier than I had expected from the series title. Miss Apple Pants: Lost in Seattle by Charlotte Roth is book one of the Miss Apple Pants Series. This book is a coming of age story but it’s really so much more than that. It really shows the ties between family, friendships and love, while also depicting the special bonds mothers and daughters have. I enjoyed the depiction of Ella’s relationship with her parents as well even though she’s not thrilled they are moving across the country. Though it’s not easy for Ella living with her hippie like pa Miss Apple Pants: Lost in Seattle by Charlotte Roth is book one of the Miss Apple Pants Series. This book is a coming of age story but it’s really so much more than that. It really shows the ties between family, friendships and love, while also depicting the special bonds mothers and daughters have. I enjoyed the depiction of Ella’s relationship with her parents as well even though she’s not thrilled they are moving across the country. Though it’s not easy for Ella living with her hippie like parents, they have a better relationship than I would have expected them to have. For Ella, this story is really a journey into finding herself. She’s faced with many challenges she’s never faced before but how she deals with them really speaks to her character. The fact that she goes through these challenges but keeps her bond with her parents is great and j really enjoyed their relationship and the overall development of the characters, especially Ella. This book is a coming of age story about a girl who has to recreate her life when she moves to a new town. Ella is moving to Seattle and has to start a fresh in a new city and new school, but her world changes when she stumbles across an old box of letters which open up her world not only to friendships but a sense of what life is about and that you are your own author in your life. I loved the way Ella felt comfortable with the writers of the letters and almost saw them as real people getting cau This book is a coming of age story about a girl who has to recreate her life when she moves to a new town. I loved the way Ella felt comfortable with the writers of the letters and almost saw them as real people getting caught up in their world while reading them just like me when I am getting into the book or story you feel like you are their friends. I loved the relationship of Ella with Miss T which developed throughout the book, by the end of the end of the story she learnt alot about herself and although her life seemed great again until she has to make a life changing decision. This author has quickly become an absolute favorite of mine. This story although a bit different than what I'm used to by her was still as enjoyable as all the rest in a different way. I could totally relate to Ella when in her senior year she has to move..this happened to me and was not something I enjoyed, but if Id had the chance to have my story go the way hers did in some places I might actually look back on it and smile a bit. I had all the feels while reading this story, and my favorite part of this authors books is her writing of the interaction between the characters, she chooses the best conversations and without knowing the words to explain this I'll just say it is awesome. Ella did experience more than someone her age should have to, yet also experienced what many young girls would love to have. I was fully invested in this story and highly recommend it. Miss Apple Pants: Lost in Seattle by Charlotte Roth is another 5-star read by this author! I am a huge fan of Charlotte’s as she always manages to write stories that completely pull me in and have me feeling all kinds of emotions. Charlotte is a truly amazing storyteller; her writing style is clear and free flowing which makes it so easy to picture everything playing out in my mind. 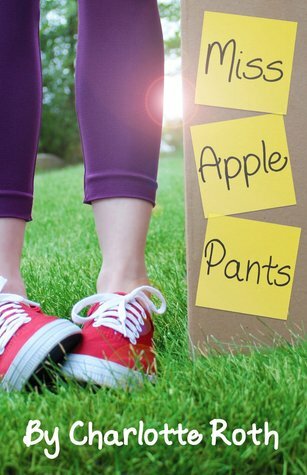 This is the first book in the Miss Apple Pants series, and it follows a funny and quirky family on a crazy adventure unlike anything I’ve ever read. I connected with these characters from the start and I thoroughly enjoyed their story from start to finish as I experienced so many emotions, from happiness, sadness, loss, heartbreak, and joy! There was so much going on which really made it feel so entertaining. I would definitely recommend this book to others! The books that I have read by this author have been more recently written by her so I was really looking forward to reading some of her earlier work. It was a really good read, completely different writing style than I am used to from Charlotte Roth but still as enjoyable. I loved the setting for the story and though that it was well described. The characters were well thought out and although it is primarily a coming of age story I could relate to the main character, Ella, quite easily. I think what I loved about this story the most was the uniqueness of the storyline. I’ve never read anything like it before and I think that is definitely what captured my interest and kept it throughout. It was a great story which a deeper meaning and it definitely has you thinking about it after you have finished reading. A well written story that I really enjoyed! I am looking forward to more from this author in the future. An odd name, that all makes sense after reading the story. Eleanor is used to odd things happening, and her parents could be embarrassing but they muddle along together well enough. At the start of the book the family are moving across country after dad loses his job. When they arrive all their stuff is missing. Somehow they’ve ended up with a moving van of someone else’s stuff, and nobody can work out what’s going on. Eleanor and her mother find letters and start reading them. Through the book there’s a lot going on. We learn the story of Martha and Frederick, the letter writers. We also see Eleanor making friends with an old woman, Miss T, also new to the area, at the same time as she falls in love and ends up having to come to terms with a rather unexpected situation. If you suspend your disbelief - just too many coincidences - this is quite charming. What a Story! This was such a beautiful read about finding oneself. I honestly thought it was going to be more like a YA read, but it was very deep. I try to start each book with an open mind, but honestly with the book cover and title, i thought it was going to be a very young easy read. Although it read easily it certainly wasn't a young read. Although revolving around a highschooler it could easily connect with anyone on a journey to find themselves. I really enjoyed the charecters, out didn' What a Story! This was such a beautiful read about finding oneself. I honestly thought it was going to be more like a YA read, but it was very deep. I really enjoyed the charecters, out didn't take me long at all to fall in love with Ellie, I honestly didn't want to book to end, because I want ready for my intersection with Ellie to end. This book really makes you think about your own life, and I could easily see it igniting a desire to truly find oneself. I highly recommend this to students entering college and those entering adulthood. Miss Apple Pants: Lost in Seattle by Charlotte Roth is a coming age story about a girl named Ella. Her family decides before her senior year of high school, to move across the country to Seattle. Ella is an old soul, who is very mature for her age but the move is hard for her, That was until she came across this box of old letters and fell in love with the writers of them. She also meets her neighbor, Miss T and develops a friendship with her. Ella, then faces a very tough decision that could ch Miss Apple Pants: Lost in Seattle by Charlotte Roth is a coming age story about a girl named Ella. Her family decides before her senior year of high school, to move across the country to Seattle. Ella is an old soul, who is very mature for her age but the move is hard for her, That was until she came across this box of old letters and fell in love with the writers of them. She also meets her neighbor, Miss T and develops a friendship with her. Ella, then faces a very tough decision that could change her life. What will she decide? Miss Apple Pants: Lost in Seattle by Charlotte Roth is a coming of age book that tells the tale of a young girl who's been uprooted and moved to Seattle. This book had my emotions sll over the place and pulled at my heart strings. I couldn't put this down once I started reading it had me entranced and turning the pages ..This book had me tearing up and laughing at times.Ella is a young woman who isnt happy about being uprooted and moved to Seattle. But she finds herself unable to stay away from the letters in the box she found.These letters were written by Martha and Frederick. The more letters she reads the more she feels connected to them.Can Seattle feel like home to Ella? I can't say enough about this book and the author whom ive read other books by but this one tops the charts for me.I highly recommend this book.i cant wait to read more from this author. This is a story about finding oneself in life. Ella just graduated from high school and is embarking on life as an adult. She finally meets her first real crush and has her first heartbreak. She experiences death of a close loved one. She experiences the joy of the bond between a mother and child, and the pain of watching a true friend go through unspeakable heartache. It's a coming-of-age story that will stay with you long after the book has ended. I became a huge fan of Charlotte Roth with this This is a story about finding oneself in life. Ella just graduated from high school and is embarking on life as an adult. She finally meets her first real crush and has her first heartbreak. She experiences death of a close loved one. She experiences the joy of the bond between a mother and child, and the pain of watching a true friend go through unspeakable heartache. It's a coming-of-age story that will stay with you long after the book has ended. I became a huge fan of Charlotte Roth with this book and have read two others by her since. Her writing style is witty and engaging and she never leaves you hanging, but somehow finds a way to leave you wanting more of her stories. I’ll start off by admitting I have been overlooking this book based on the title, I wasn’t sure if the book would be geared towards a younger audience. I have been really enjoying Charlotte Roth’s writing lately and felt that I should give this book a try since her writing hasn’t let me down yet. I have to say I am really happy I took a chance and read this, it was just as fulfilling as past reads by this author. Miss Apple Pants: Lost in Seattle by: Charlotte Roth is a young adult coming of age story that is full of heartwarming and heartbreaking moments. Charlotte is a storyteller that draws you into her world and her writing style flow easily. There are a lot of emotions in this book from happiness and sadness, joy and sorrow that enable you to connect with these well thought out characters and enjoy their story. The style of the writing for this book is completely different from Charlotte but it work Miss Apple Pants: Lost in Seattle by: Charlotte Roth is a young adult coming of age story that is full of heartwarming and heartbreaking moments. Charlotte is a storyteller that draws you into her world and her writing style flow easily. There are a lot of emotions in this book from happiness and sadness, joy and sorrow that enable you to connect with these well thought out characters and enjoy their story. The style of the writing for this book is completely different from Charlotte but it works and adds to the uniqueness of the storyline. If you want a book that will take you on many rollercoaster loops, keep you in the edge of your seat at the same time making you cozy in that same seat then this is the book for you! Ella and her family are simply amazing to get to know. They glide through quite a few obstacles and come out full of hope and love at the other end. Really no words are adequate to describe how you will feel falling in love with Ella, her family, their lives and Lost in Seattle in general!! This was a cute coming of age story that touched many areas of my heart!It's one of those YA reads that will screw with your heat but heal it in the end! This wasn't the first read from this author but, I'll be honest wasn't my favorite. It was beautifully written but i fell like there were a lot of "filler" details that we didn't need but overall the book was amazing. I loved how it hooked me and kept me intrigue through the whole story. This author is one of my favs and a must have one click! I enjoyed this book from beginning to end. It is a sweet story about a young girl who is trying to find herself in life. This book took me on an emotional roller coaster right along with the characters. I don't think there is a life experience that Ella does not experience. The characters are connectable and relateble. They made me feel as if I was right in the story with them, they pulled me right in. I highly suggest this book. This book is a coming of age story about a girl whose life is turned upside-down when she moves to a new city. After a mishap with the moving truck her and her mother start to read letters written by Martha and Fredrick. Not only are we seeing how Eleanor’s life pans but Martha’s and Fredrick’s past. We see a friend ship blossoming between Eleanor and Miss T.
I haven’t read anything by this author before but will be reading more in the future. This book was great, it had good pace and flows well. The titles of the chapter were different but cute. I love the characters and how they blended together. This book sure is full of emotions that you may need a tissue. I feel like what the main characters found made her a stronger person. I loved turning each page of this book. It takes you on a journey through more than one life. I will recommend this book to everyone. When she’s not ‘mom’ (read= doing laundry, making lunches, and solving kids’ world crisis), she spends every second of her free time writing what readers call compe Charlotte is a mom, a wife, and an author—in that order. She’s originally from Denmark but moved to Seattle in 2005 with her husband, baby Alfred, and lots of hopes and dreams. The family has since added the twincesses, Emma and Olivia.